Pelikan Hardcopy is a leading supplier of industrial thermal transfer ribbons for use in barcode label printers, desktop printers, inline coders as well as plain paper fax machines. Correctable ribbons and MICR ribbons for security printing are also part of its range. Seeking to improve machine speeds at its Turriff site in Aberdeenshire, Pelikan Coating Technologist Derek McDonald contacted a number of equipment suppliers with a view to the installation of up-grades to production machines. 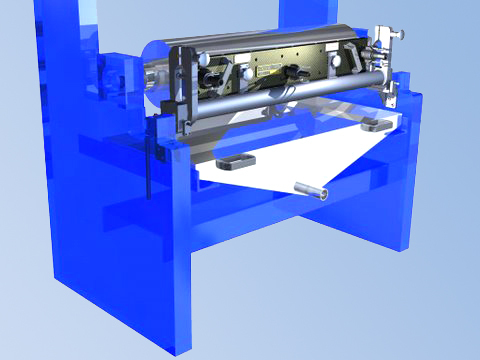 From this initial investigation, Delpro Limited, specialist designers and manufacturers of equipment for the converting packaging and printing industries, was chosen to fit a Bone Markham machine with their carbon fibre chamber doctor blade system as a replacement for a conventional open pan and adjustable trailing blade assembly. The immediate success of this up-grade led to an order for similar equipment to be fitted to two additional machines. The reverse gravure Bone Markham machine applies a solvent-based carbon black coating. On one particular product not only was the machine speed increased from 40 to 100 MPM, but a number of other advantages were also gained. Set-up time and coating and substrate waste in achieving defined coat weight was reduced; change-over time from one coating to the next was also reduced together with savings in waste coating volume; gelling of coating mix in the coating tray was eliminated; and evaporation of coating solvent was diminished due to the reduced open area of the chamber. Repeatability of coating weight without the need for operator intervention was a further significant benefit. The subsequent fitting of a hopper-fed, heated aluminium chamber and mounting mechanism to a second machine, and a carbon fibre chamber with mounting and coating yoke mechanism to a third machine produced similar outstanding results – the latter for the first time enabling the machine to achieve satisfactory results. Commenting, Derek McDonald said: "We are obviously very pleased with the way we can now run our machines at higher production speeds. Mechanical installation and commissioning was completed within two days and we were impressed with the Delpro approach and efficient way they went about tackling the project".